"Hmmm...looks like you could use a longer stem, Gum'." Has coached cyclists to State Championships in all cycling disciplines -- Road (Road Racing, Criteriums, Time Trials), Track (Timed and Mass-Start Events, Sprint and Endurance Distances), and Cyclo-Cross. Has coached cyclist to top-10 at National Track Championships. Develop individual and group bike handling skills. Develop individual and team race strategies and tactics. Provide Basic Physiological Testing -- measure body composition; establish heart rate training zones; estimate lactate threshold; measure muscular flexibility, power, strength, and endurance. Design a personal on-bike training program -- as detailed as you wish. Design a personal sports-specific "prehab" and strengthening program. Contact Coach Pat at phschlager@aol.com. Check out Coach Pat's facebook page. Began road racing as a Cat 5 in 1996. Upgraded to Cat 4 in 1998. Became a United States Cycling Federation (USCF) Certified Sport-Level Cycling Coach in 1997. 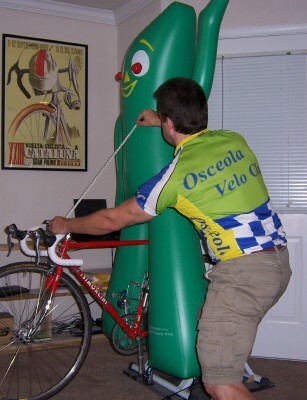 Founded the Osceola County Cycling Club in 1998, name changed to the Osceola Velo Club in 2005. Became a National Strength & Conditioning Association (NSCA) Certified Strength & Conditioning Specialist (CSCS) in 2001. Became a USA Cycling Licensed Club-Level Coach in 2005, renamed Level 3 Coach in November 2005. Inducted into the Kansas Cycling Association (KCA) Hall of Fame in 2014. Earned his Master of Science degree from the University of Kansas, Department of Physics, Astronomy, and Atmospheric Sciences in 1988. Earned his Bachelor of Health Science degree in Physical Therapy from the University of Florida in 1994. Became a Licensed Physical Therapist in Florida in 1994 and in Kansas in 2010. 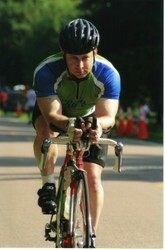 Coach Pat at the 2007 Florida Time Trial Championships.